Turning conventional wisdom on its head, this book shows how to garden like Mother Nature, offering a system that's good for plants and good for people. Eschewing the yearly digging up and working over the soil, WEEDLESS GARDENING is an easy-to-follow, low-impact approach to planting and maintaining a flower garden, a vegetable garden, trees, and shrubs naturally. Say good-bye to backaches and weed problems. Illustrated. Roger Swain (Host of The Victory Garden) says: "The deepest wisdom gardening has to offer. Do as Lee Reich says. Pay attention to the top few inches of soil and nature will take care of the rest." "Lee Reich has shortened the interval from innocence to ah-ha to fascination. 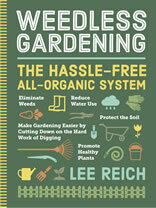 This handy little book should be handed out to every new gardener along with his first trowel."